Michael Turner's skill with the pencil and battle with cancer showed everyone how to 'fight the good fight' on and off the comicbook page. 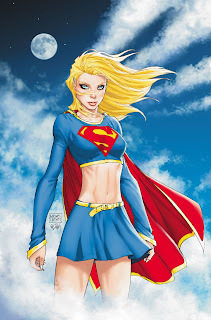 An incredibly nice guy from all accounts, DC Comics is set to mark his unfortunate passing by giving the artist the cover of the milestone 50th issue, of the character he helped restore to their world; Supergirl. I am gobsmacked - not only is it an iconic image of the 'Maid of Might' - it is a really noble move from DC. If they donate a portion of its February sales to a cancer charity that would just be phenomenal.